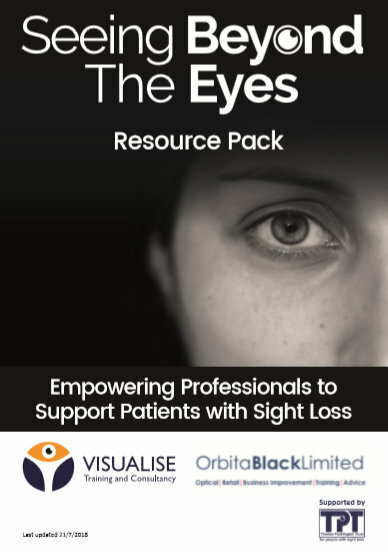 Following the success of the Seeing Beyond the Eyes CET roadshow which brings the optical and sight loss sectors together for the benefit of patients with low vision, Visualise Training and Consultancy, with the support of Thomas Pocklington Trust, has launched a Resource Pack for Professionals which enables opticians to easily locate and refer patients to support services. Suppliers of low vision aids and daily living solutions are also included to help readers locate specialised assistive technology and equipment. The free pack has been well received and is available in hard copy or digital formats. Kathryn Batchelor-Dove and Michelle Dove of Dove & Conway Opticians in Bicester said “We want our practice to be a relaxed friendly environment, with time for people to talk, whether to simply chat or ask as many questions as they want without feeling pressured. Since taking that time with them, it became obvious that patients were not aware of resources, helplines or technology that could help. We had been trying to pull together information sheets for people, but even as eye care professionals, we had been struggling to make sense of the different roles and had thought that we might complicate things if someone is already within the hospital service for low vision. The workshop and resource pack have helped us to be clearer about the difference we can make by referring for social and charity-based help at the same time as to the medical services. The pack is clear, detailed, and gives us a much better idea of what type of help is available. Now we feel we can make a real difference, by being a first point of contact for many people. We’ve already used the pack to raise awareness with local GPs, to pass on advice and access to counselling services and charities to patients and family members. It gave us the confidence to help a lady with very poor visual acuity and reduced field, who had not been registered with low vision or have any idea of the benefits. Though in the past we would have had a chat about registration, we might have assumed there was a reason that she had not been registered, and not wanted to interfere in her care or complicate matters. We are grateful for the pack and the training, it gives us the confidence that we are not complicating matters by potentially giving them old or out of date information.